This version is perfect for vegetarians. It is not ascetic, very tasty, especially when it is hot. Mushrooms obtain juicy and flavorful, everything you need is to take a large mushrooms. • Onions (100 g) – 1 pc. Put basmati rice in salted water and boil. You can take any long grain. 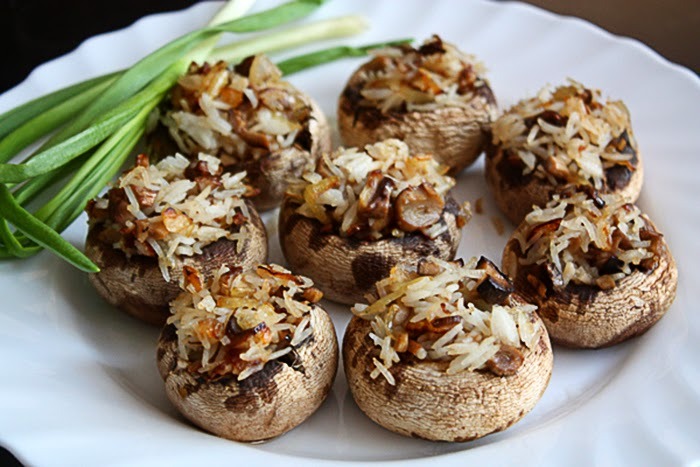 Wash mushrooms, remove their legs, and spread it like a cups on the baking dish. Chop onions and fry a little in oil. Then add chopped mushrooms back legs and continue to fry until golden brown. Add cooked rice to the pan; add salt and pepper, taste and mix. Fill pileus with the stuffing as tightly as possible and bake in the oven at 190C for about 20 minutes.